Yesterday’s signals may have triggered a short trade entry following the large outside doji candlestick which formed on the hourly chart rejecting the resistance level at $4,100. This trade now looks very uncertain so it might be wise not to hold on to any short if it is showing a loss now. Go long after a bullish price action reversal on the H1 time frame following the next touch of $3,914 or $3,741. Go short after a bearish price action reversal on the H1 time frame following the next touch of $4,100 or $4,373. I wrote yesterday that the signs were all weakly bullish and I would take a bullish bias later if there was a bullish bounce at $3,914. A sustained break above $4,100 would be a more bullish sign yet. 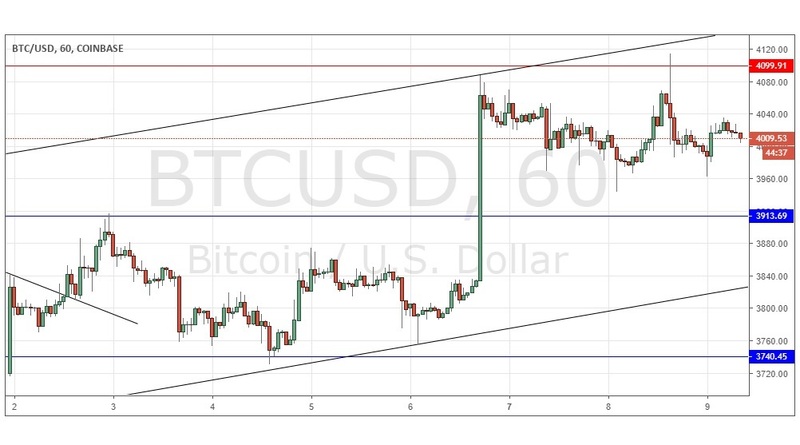 This was a good call as the technical bullishness has held, although the price was unable to break above the resistance level at $4,100 which would have been a more strongly bullish sign. So, the situation here is unchanged: I would be bullish following a healthy bounce at $3,914 or following a sustained break above $4,100. The price has room to rise beyond $4,100 for some way until it meets the next resistance level. Risky assets are generally rising right now, and that tide could help lift the price of Bitcoin by a few hundred dollars. Regarding the USD, there will be a release of the FOMC Meeting Minutes at 7pm London time.